Since 2006, independent analyst and AppleInsider contributor Andy Zaky of Bullish Cross has only published four total public buy ratings on Apple stock. Read why on Thursday, he initiated his fifth buy rating for Apple, and first in 11 months. Today, we are initiating our 5th ever buy rating on Apple just about 11-months after the last recommendation we gave. We tend to only publish these buy rating under extraordinary circumstances, when Apple has been extremely oversold and when the stock's valuation has become incredibly depressed. We also only publish these ratings once the markets have seen a substantial sell-off or prolonged period of consolidation. The current conditions meet all of our criteria. As a result we are publishing our comments on why it is time to buy Apple. Notice that the last four buy ratings were made right at or near the exact lows each time. Our buy ratings are a little different than what one would normally expect in that we give a band where we feel the stock is a strong buy and where the stock is a buy. We also give a price target. But what we dont do is publish an ongoing buy rating. Our buy ratings are thus temporary in nature. Bullish Cross has never missed a long-term price target on Apple as you can see here. Today we feel that Apple is a strong buy anywhere between $500 and $530 a share and a buy between $530 and $550 a share. 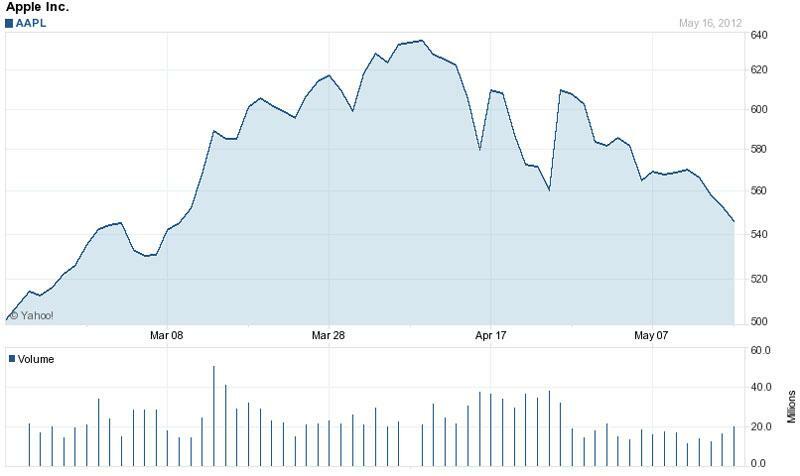 We expect Apple to test $750 a share sometime before the end of this coming January. That is roughly 50% higher than where the stock is trading today. Now here are the reasons why we believe its time to buy Apple and why we feel the valuation is incredibly attractive today. At $533.52 a share, Apple trades at 13x last years earnings and at only 10.56x our expect October earnings. Those are incredibly low valuations even for Apple. At the November 25, 2011 lows, Apple traded at a 13.13 P/E ratio. So today, Apple is trading at a lower valuation than it was at the November lows. At the June 2011 lows, Apple was trading near a 15 P/E trailing P/E ratio. Those who have been waiting for a correction in Apple to buy the stock, now have that opportunity to do so. On a technical basis, Apple is the second most oversold it has been since the lows of the financial crisis. Only on June 20, 2011  when Apple bottomed at $310.50 a share ahead of a 30% July rally  did we see more oversold conditions on Apple. Even the flash crash didnt result in more oversold conditions nor did any period during the 2010 summer correction. At no time during the summer 2011 correction did Apple see more oversold conditions. So today, Apple is not only very attractively valued as it trades at a near 8-year low P/E ratio, the stock is also incredibly oversold. Moreover, the stock has now retraced 38.2% of its gains it recorded in the rally between $363.21 in November and $644.00 in April. At $500 a share, Apple would trade at a 12.18 P/E ratio and the stock would have retraced 50% of its gains. Thats why the area between $500 and $530 presents with a very unique buying opportunity while the area between $530 and $550 presents with a relatively rare buying opportunity that we see a handful of times in a year. You can see our past buy ratings here and the ensuing results.